Our custom personalized 50-sheet pads (a.k.a. paper memo pads or non-adhesive note pads) are perfect and economical for business or personal use. Our pricing includes 1-4 spot colors or full four color process printing for the same price. Keep it handy and have your message seen on a daily basis. Our custom personalized 50-sheet pads (a.k.a. paper memo pads or non-adhesive note pads) are perfect and economical for business or personal use. Our pricing includes 1-4 spot colors or full four color process printing for the same price, so your budget never will never force you to decide how many colors you can afford on scratch pads. Keep it handy and have your message seen on a daily basis. Color of product is white. Material is 50 lb. offset only, with white 12 point backer card. 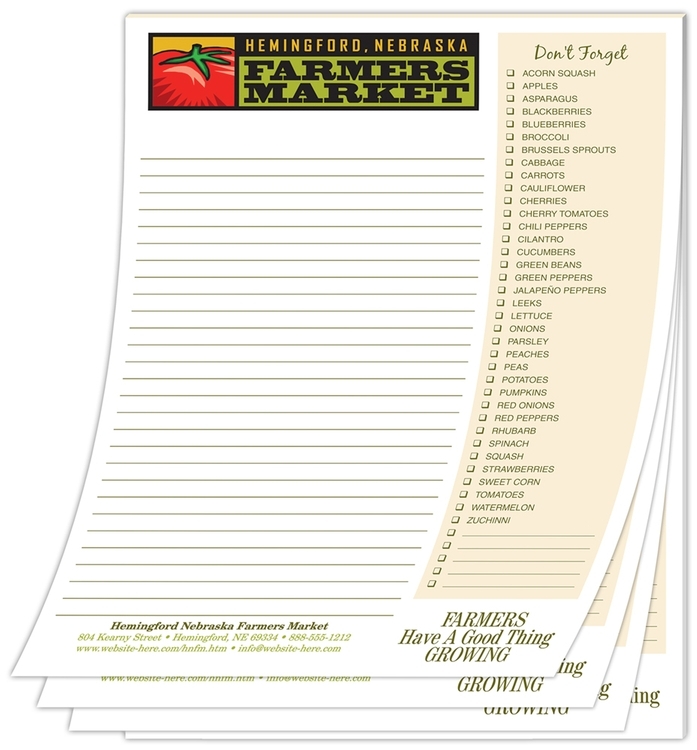 Standard pricing includes a One (1) to four (4) standard spot color imprint, on one side. Up to four(4) PMS matches, full-color (four color process) and/or full bleeds are available for an additional charge (see options tab) We do not recommend the printing of type smaller than 8-pt in size due to legibility. Exact color matches, metallic or fluorescent colors cannot be printed in full-color (four color process). When it comes to imprinting promotional products, the type of artwork files accepted will vary depending on the product(s) ordered. Vectorized artwork is always recommended for optimal printing. Make sure to convert all text to outlines/paths prior to sending us your artwork files. For certain products, rasterized artwork may be accepted as well. The resolution for rasterized artwork should be set at 300 dpi or higher. How to get us your artwork. You can upload your artwork when placing an order on our website. You can also upload your artwork files using the form to the right. And of course, you can always email it to us at hello@steinadpromos.com. If you have any questions, or need assistance with your art, we are here to help — we know some of this sounds like a foreign language! Also, we put together a nifty handout that helps spell out what exactly is and is not artwork. Click the link below to check it out.